In this interview, Actor Michael Pena and director David Ayer talk about reuniting to collaborate on Fury, a World War II adventure, starring Brad Pitt. Michael Pena’s parents were immigrants from Mexico, and Michael was born in Chicago on January 13, 1976. After leaving high school, saw an open casting call for Peter Bogdanovich’s feature, the sequel to To Sir, with Love. He was chosen and relocated to Los Angeles. Michael had a number of roles in features, including Star Maps, My Fellow Americans (1996) with Jack Lemmon and James Garner, La Cucaracha (1998), which won Best Picture award at the Austin Film Festival, Bellyfruit (1999), and Gone in Sixty Seconds (2000). He has also delivered memorable performances in Crash, Million Dollar Baby, Babel and The Lincoln Lawyer, and took lead roles in World Trade Center and End of Watch. Earlier this year, he played the title character in the biopic about Cesar Chavez. David Ayer was born in 1968 in Champaign, Illinois, USA. He served in the United States Navy, and his friend and mentor, Wesley Strick, helped get him a break in Hollywood as a script doctor, and he revised the script for DJ Caruso’s thriller Taking Lives. David is a writer and director. See End of Watch (2012), Training Day (2001) and The Fast and the Furious (2001). KW: I loved Fury! Great job! Did you read my blurb about the movie? KW: I described it as a WWII tank flick you don’t so much watch as endure. Picture the sheer intensity of Saving Private Ryan coupled with the visual capture of The Thin Red Line, the harrowing claustrophobia of Das Boot, and the utter insanity of Apocalypse Now. DA: That’s pretty damn good, bro! KW: I’ll be mixing in readers’ questions with some of my own. Attorney Bernadette Beekman asks: David, what is the most significant memory from your military service which continues to influence your writing today? DA: Holy cow! Nothing I would care to say in public. [LOL] Actually, there’s nothing I could say in public, because of my security covenants. My proudest moment was being awarded my submarine warfare qualifications pin in the Philippines after a lot of intense studying. KW: David, given that you served in the Navy, where did the idea for Fury come from? DA: I had one grandfather who was in the Army in World War II, and my other grandfather served in a Navy submarine during the war. And I had an uncle in the Army Air Corps. But I’ve always been fascinated by the war in Europe. And I kinda realized that no one had done a tank movie about it. It was sort of long overdue. So, I hope this becomes the classic American tank movie, the Top Gun for the Armored Corps. KW: I think you achieved that given how you make the audience feel like they’re right inside the tank and have us pulling for the crew at every turn. I was sweating bullets. KW: Bernadette asks Michael: Having appeared in multiple Ayer-written works, do you have an affinity for an Ayer script. Do you feel a certain rhythm to the dialogue in each film? KW: Bernadette asks: Michael, do you have a preference for roles in a certain genre? Is there a type of role you tend to seek to play? MP: I didn’t go to acting school. Because I didn’t have a lot of cash, the way I taught myself how to act was by watching all of the early Inside the Actor’s Studio episodes. I watched Marlon Brando in A Streetcar Named Desire and Robert De Niro’s Mean Streets a hundred times. 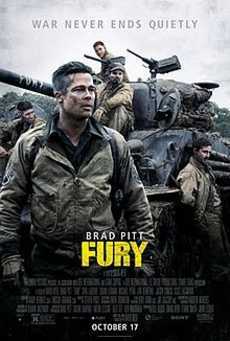 I prefer films that are very, very real, like Crash, End of Watch and now Fury. I just enjoy the basic human drama. KW: Editor/Legist Patricia Turnier asks: Michael, How did you prepare for the role of Gordo? MP: It was tough because, although it was all there on the page, I wanted to represent more of a generational figure. So, I took from a bunch of other people. But as for the voice, David would talk to me in Spanish in kind of the same rhythm, because I could easily lose it, especially since we were filming in England where I was surrounded on the set by so many British accents. So, I needed a little more help on this one than usual. To me, the voice was a critical aspect of the character, because Gordo has a different sense of humor. He’s kind of a simple man. I thought about the way my dad is. He grew up in Mexico, and was a farmer. He’s a very simple, quiet, brooding man. KW: Patricia also asks: Michael, You recently portrayed Cesar Chavez? MP: He means an awful lot, to be honest with you. My parents were farmers who came to the U.S. for the American Dream. They still grew cucumbers and peppers and corn in the backyard, because we didn’t have much money. They came to this country because people had taken advantage of them in Mexico. And here comes this small man by the name of Cesar Chavez who actually fought for their rights. It wasn’t the easiest thing for him to do, to speak up on behalf of people who didn’t have a voice. And he actually took it upon himself to do just that, and he made a big difference. So, it was an honor for me to be given an opportunity to portray him. KW: Margaret Van Dagens says: You are both from the Midwest, and both originally from Illinois, my home state. I’d like to know how being from the Midwest has influenced your work, and whether being from there gave you a feeling of camaraderie as you collaborate on projects. This is not as superficial a question as it may sound. I feel that being from the Midwest has made a great difference in my work. MP: Honestly, I didn’t even know David was from the Midwest until this minute. DA: Yeah, I bounced out of there as a kid, and pretty much grew up in L.A.
KW: Harriet Pakula-Teweles asks: David, how do you walk the fine line between gore and gripping? DA: You don’t want to take your audience out of the movie, and too much of the wrong thing can do that. Violence and violent images obviously have a strong effect. If it’s gratuitous, it ain’t good. It has to have a reason. For me, especially in this film, violence has consequences. And the violence is part of the environment this band of brothers lives in. These guys are like a family trying to survive in a violent environment. So, every violent act is reflected in these characters. And they have to process them and come to terms with them. KW: Harriet has one for you Michael. She says: You’ve just done a biopic and an action film based on true storiesa'”how is the preparation different from roles based on fiction? MP: I don’t really think there is much of a difference. I try to do the same kind of work from picture to picture. The only time it’s different is when I’m doing comedy. Then, the main focus is on making people laugh. And then, secondarily, you try to find the drama in it. I grew up in the ghetto, and I remember not realizing I lived in the ‘hood until I moved out of there. Then, I was like, “Oh man, I used to live like crap. Holy cow!” The crackheads and heroin addicts weren’t cool, but other than that I had so much fun growing up. KW: Harriet also asks: With so many classic films being redone, is there a remake you’d like to direct, David? DA: That’s hard for me to say. Because I’m a writer, it’s easy for me to generate material for myself. My big advantage as a director is that I’m also a writer. The way that markets work now, everything has to be PG-13, and you have to kind of go for a broader audience. So, the problem with remakes is that a lot of what made an original special can get watered down or lost. KW: Thanks again for the time, guys, and best of luck with the film.